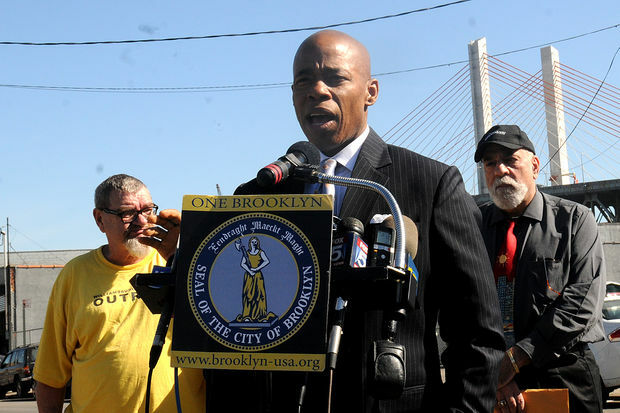 Brooklyn Borough President Eric Adams said on Friday he was not informed about plans to implode part of the Kosciuszko Bridge, Feb. 24, 2017. GREENPOINT — Officials and community members expressed their anger Friday about not being kept in the loop about plans to implode the Kosciuszko Bridge. Brooklyn Borough President Eric Adams said local leaders found out about the plan through media reports and were not briefed about any potential environmental impact from the demolition. “The community at large and the local electeds should not find out from reading in the tabloids any new methods that are used that could potentially damage the climate cleanup that we have attempted to do in this community and have worked so hard to accomplish,” Adams said during a press conference near the bridge. Adams said he spoke with the governor’s office Thursday and Friday and was told there would be a public briefing on how the dismantling will take place. Lifetime Greenpoint resident Laura Hofmann, 59, said she thinks Gov. Andrew Cuomo “owes the community an apology” and that the announcement hurt the process of keeping the community engaged in decisions. Adams reiterated the point and said he would work to make sure the state engaged with local residents. A spokesman for the governor's office said they have held more than 140 public meetings on the project.